Charice Marin has lived her entire life with a father who is nothing more than a shadowy figure who dances on the fringes of her consciousness. 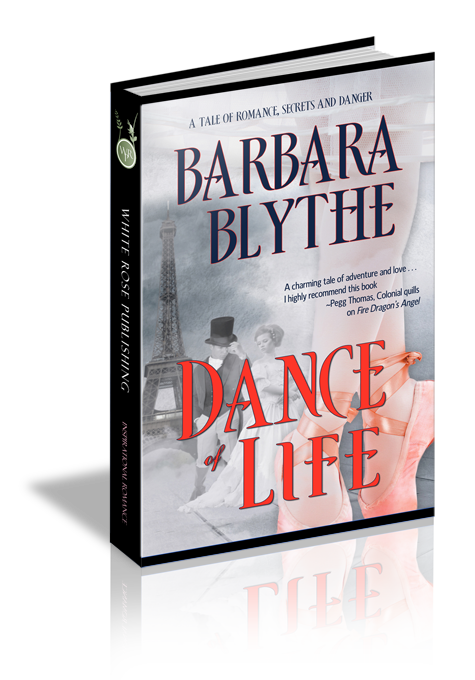 While in Paris, the American prima ballerina finds herself partnered with a danseur noble with his own share of shadows and secrets, and from their first meeting, her life is never the same. Dangerous complications arise when an unscrupulous man from her mother's past reappears making it necessary for Charice to find her father if she is to save herself and her mother. But her discoveries only serve to throw suspicion on her mother, her mysterious father, and her late sister's husband. Can danseur, Domitri Auberchon, convince Charice he can be trusted when his past threatens their love and their future? Rosin, sweat, and gas permeated the charged air, thick with discord and the Russian rants of Nicolai Rubenevski. Feet aching and head pounding, Charice Marin wondered how much longer she could put up with this. Poor Mira stood before Rubenevski, head hanging as she bore the brunt of the man’s tirade. Didn’t the man realize he was wasting his breath chastising Mira in Russian when she spoke only French? He’d been shouting nonstop for thirty minutes because Mira’s slipper ribbons had loosened during the rehearsal of the opening act. Charice feared the girl now wished she’d remained in her village and married the neighboring sheepherder her parents had favored instead of running away to Paris to become a ballerina. Releasing a sigh while summoning her nerve, she prepared to present herself on stage and end Rubenevski’s tirade. There’d be no practice if she didn’t. The man had been known to shout and yell for hours. Lifting her chin and stretching her neck to regal lengths, as her mother did when portraying a woman who would not be denied, Charice darted out of the shadows. And slammed into the broad back of a man. Inconsiderate oaf. Couldn’t he see me? He stepped right in front of me. A sense of familiarity settled as the deep timbre of his voice vibrated within her. Broad shoulders were defined by the taut linen of his pristine white shirt. Trousers hugged corded thighs while his scuffed boots outlined muscular calves. He had the look of a danseur. With his towering height, he was almost intimidating. But Charie would not be intimidated—not by this man who seemed far too certain of himself. “Aucun préjudice causé.” No harm done. Averting her gaze, she hurried past. Was that a soft chuckle that floated behind her? “You are a thoughtless, witless girl,” Rubenevski barked, his volume shaking the rafters. Charie cringed, thankful that Mira couldn’t understand his words. She wished she couldn’t. Behind Rubenevski stood Antoine, shifting from one foot to the other while exuding indifference. The egotistical danseur had no care that a member of the company suffered humiliation. Charie noticed his shoulders lacked the breadth of the man’s who’d bumped her. Banishing the unwarranted comparison, she cleared her throat. “Gospodin Rubenevski, if I could have a word.” Charie’s flawless Russian caught the man’s attention, and he fell silent. Swallowing hard, she met his enraged glare and stopped before him. Intakes of breath occurred simultaneously, and the ensuing silence deafened as all awaited Rubenevski’s response. Charie wasn’t sure she was breathing. Charie felt faint from a suffocating heat. An overwhelming need to escape took hold while tears burned behind her eyes. Her breathing dissolved to short, angry gasps. A movement near the curtain ropes caught her eye. It was the annoyingly handsome man who seemed to enjoy the unfolding drama. At her expense. Elevating her chin, she met Rubenevski’s livid gaze. Something deep within her exploded, and aware she was about to either burst into tears or slap Monsieur Rubenevski, she whirled around and retreated. As she passed the annoying stranger, he reached out as though to stop her, sympathy spread across his rugged features. Shaking her head, she surged forward, pausing only long enough to retrieve her cloak from her dressing room. Throwing it about her shoulders, she fled the backstage area, flew down the stairs, and exited through a rear door. A blast of cold October air enveloped, while a steady mist and red-gold leaves coated her. Lowering her head, she pushed into the wind, her steps automatically taking her towards the Théâtre Impérial. Charie had just divested her wet cloak, and commenced pacing when commotion in the hallway signaled the advent of her mother. Which meant the final curtain had fallen on the Thursday matinee of The Misadventures of Sally. Charie hurriedly smoothed the tendrils of her curling, auburn hair that had loosened during practice and her recent dash though the wind and rain. Her mother always looked elegant, perfectly attired, and every hair in place. No torn stockings and worn tutu for Matilda Marin. The door of the dressing room burst open, and her mother swept within, her arms laden with roses and lilies, while her dresser, the ever patient and mothering Swede, Lizbet Borgensen, shooed the lauding throng away. Order was immediately restored as Lizzie slammed the door in the face of a balding, rotund, mustachioed man. The flowers perfumed the air, so much so that her mother cracked a window. As soon as she turned towards Charie, concern clouded her crystal blue eyes. “This can’t be good. I’ve never known you to visit me in the middle of the day.” Her mother spoke English, her slight drawl marking her as a Virginia native. “Oh, Maman, everything is all wrong.” Releasing a sob, Charie moved towards her mother, warmth enfolding as Matilda wrapped her in her arms. “No.” Charie pushed away. Folding her hands, she paced. “I need your advice. Monsieur Rubenevski spent all morning and part of the afternoon shouting in Russian, and then informed me Monsieur Phillipe has decided I will dance with Roberto Capretti in the company’s performance of Long Ago in Bethlehem. You know how I feel about the man. I’ve a good mind to quit the ballet, Maman. “Monsieur Rubenevski said I shouldn’t worry so much about ethics or principles. It’s bad enough that people accuse us of immorality because we are performers. If I dance with Capretti, there are those who will think, ‘birds of a feather—’” Charie shuddered. Matilda grasped her hand and led her to the divan. They sat down and her mother gathered her close as she had when Charie was a child. And as though she was, Charie laid her head on her mother’s shoulder. “I told you long ago we don’t fit society’s idea of a lady. But in God’s eyes, we’re just as much a lady as— and maybe more so than—some tongue wagging, tongue lashing, hoity-toity socially acceptable female. When I decided to become an actress, most of my kin nearly died, including Ma and Pa.” Matilda now sounded like the simple southern girl she’d been at the age of seventeen when her love of performing had drawn her to New York City. Her mother shared a strained relationship with the Russian noble who was the patron of the Ballet Eleganté. The two never saw eye to eye on anything, and sometimes Charie felt like a rope tugged back and forth between them. Their on-going battle had waged for nearly four years, ever since Count Olar Stanislov had taken the corp de ballet, bordering on bankruptcy and on the verge of disbanding, under his wing, physically and financially. Lizzie, who’d remained silent during their discussion, shuffled the gowns in her mother’s armoire, an indication that she was ready to help Matilda out of the costume she wore in her portrayal of Sally Sharp, a feather-brained beauty with romantic troubles that somehow resolved themselves humorously. If only Charie could resolve hers in the same manner. “Stay as long as you like.” Her mother gave her one of those “everything’s going to be fine” smiles. A troubled light clouded her mother’s eyes. “He should have done his duty by you. And me,” she added with a whisper. “Yes, I know. Don’t speak or think badly of him. He was a man, and I quote, ‘zealously committed to honor.’” Charie had hoped to lighten the mood, but her mother’s expression told her she’d failed miserably. “I promise to be home for dinner. I couldn’t endure a scolding from Madame Jeaneau after listening to Monsieur Rubenevski. Au revoir,” she called over her shoulder as she headed to the door. Opening it, she stifled a cry when she realized the obese man she’d glimpsed earlier still lurked outside her mother’s dressing room. Not wanting her mother disturbed, she closed the door quickly. Ignoring him, she set off down the hall, her ballet slippers making but a wisp of sound. As she approached the stairwell, the man’s heavy tread followed. He was a persistent someone. Irritated, she twirled around. “Madame Marin’s next performance will be tomorrow night,” Charie explained impatiently in French. “I’m not here to see Madame Marin.” The man replied in English, his accent bearing traces of the New Yorker. She would know—she’d lived there with her mother for the better part of twelve years. “I don’t understand.” She replied in English. “Aren’t you Charice Marin, prima danseuse of the Ballet Eleganté?” The man drew forth a handkerchief to wipe his damp brow. The hallway was anything but warm. She was chilled, and the man before her added fear to her chill. Charie reined in her imagination, and though the ardent admirers and theatre crew had departed, her mother and Lizzie were not far away and could easily hear if she called out. Even so, she pulled her cape closer. “I am. What do you want?” She made no attempt to hide her annoyance. “My father?” Charie regarded the man incredulously, odd that she’d just mentioned her father, something she rarely did. Now this complete stranger referred to him. “There you are, Mademoiselle Marin. I’ve looked all over for you. Rubenevski is beside himself with worry.” Strong fingers gripped Charie’s upper arm as the deep, richly accented voice penetrated her apprehension. Pulling her gaze from the irritating bald man, she raised her head. Stormy green eyes met hers with such intensity her knees nearly buckled—the man from the theatre? Before she could gather her wits, she was ushered down the stairs, the pudgy man sputtering and cursing as he was left behind, unable to keep up with their rapid descent. Upon reaching the lower level, she snatched her arm free—no small feat and undeniably painful, and then turned upon this new, unwelcome presence. “Just who—” Charie’s voice died in her throat as she took a good look at the man. Nearly a foot taller than she, he exuded a physical strength that both frightened and attracted. His topcoat hung open, and the cut of his serviceable jacket conveyed the fact he was no slave to fashion. The neck cloth was haphazardly tied, and the buttons on his vest matched up one hole lower than they should have. Untamed hair hung unconventionally long; that lock still falling boyishly over his brow. But it was his face that sent her reeling. The scar she’d glimpsed earlier ran a jagged path from his left temple to his jaw, marring his sculpted features. “An angel of mercy when compared to the man with whom you were previously conversing.” His English was flawless, but flavored with a hint of the Slav. There was no trace of a smile; no jesting gleam in his eyes. They remained a frigid green, and his scarred jaw twitched with vexation. Hackles rising, Charie forgot that seconds earlier she’d been terrified. “It’s time you returned to rehearsal.” He reached out as though to take hold of her already bruised arm. She stepped back. “I was planning to do so. Without your help. I don’t know who you are or why you’re here, but you’re not welcome.” With that pronouncement, she strode past him, wondering how Monsieur Rubenevski’s fit of temper had precipitated such strange events for her. She was more than ready to return to the rehearsal if it would make the odious New Yorker and the iron-jawed eastern European go away. Wrapping her cloak closer, she braced for the wind and mist. Something in his tone made her pause and look behind her. Sure enough the short, fat man was in pursuit. Without thinking through her actions, Charie grabbed the man’s hand and broke into a run.